Congratulations to the Winners of the 2019 Young Artists’ Competition! COT’s first Young Artists’ Competition (YAC) in 1984 was the only event of its kind in this area for high-school age musicians. Other competitions in town were open to college-age students as well, so the younger children rarely had a chance to win the opportunity to perform. Now in its 35th year, the competition has expanded to three categories: winds and percussion, piano, and strings. Each category is judged separately with both a junior and a senior division. The competition offers students a good introduction to the audition process. Winners gain public exposure and are awarded cash prizes. 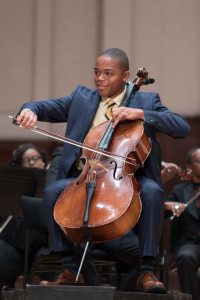 The event provides each entrant a unique learning experience, and music teachers from both studios and schools applaud the orchestra for this contribution to the young musicians’ development. To date, COT has hosted over 70 performances by students ranging from elementary to high-school age. We will again be offering an Ensemble category, the first of its kind in Tucson. Groups of 2 to 10 young musicians may apply together as an ensemble and perform a chamber work. Groups may consist of students of any age (up through Grade 12). The selected piece should not require orchestral accompaniment. Read the Rules & Eligibility document below for all the details. Clarinetist Quinton Nickum, winner of our 2017 Senior Winds Division and soloist at our Pops Concert at Reid Park that year, is headed to his “dream school,” Northwestern University in Chicago. He plans a double major in Clarinet Performance and Music Education–and has been granted a full, four-year scholarship. Trevor Barroero, percussionist and two-time winner of our Young Artists’ Competition was the soloist at our 2017 Benefit Concert to support the competition. Since that time, he has won several major competitions, which enabled him to perform with the Moscow Symphony Orchestra and the United States Army Band. 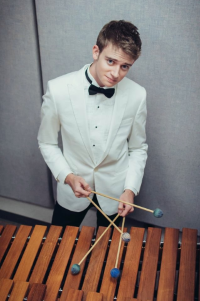 He is current a graduate student at the University of Georgia working toward a Masters of Music in Percussion Performance. On October 1, 2018, he announced that he has been appointed Principal Percussionist with the Orlando Philharmonic Orchestra. Visit Trevor’s website.